A Facebook complaint from a former Claire’s employee has gone viral, sparking a debate about how employees should handle unhappy children who clearly don’t want their ears pierced. In her open letter to Claire’s corporate—which has garnered thousands of reactions and led to numerous news stories—Raylene Marks, a former employee of Claire’s in Edmonton, Alberta, said she reached her “breaking point” with the retailer last week, when a 7-year-old was brought in to get her ears pierced. According to Marks, the girl very obviously did not want to go through with it, even with a (piercing) gun to her head. “The girl pleaded and sobbed for 30 minutes not to be pierced,” said the post. “Despite Mom saying, ‘Honey, we can go home whenever you want,’ she was not letting her daughter go home. 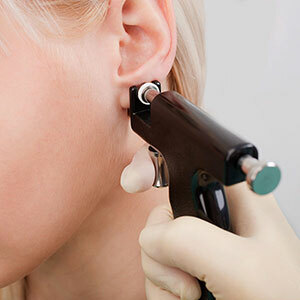 She was putting a great deal of pressure on her daughter to go through with the piercing. The next day, Marks’ manager told her, if the mother insisted, she would have had to do the piercing. Marks quit the same day. Claire’s could not be reached for comment. However, on its Facebook page, the company told a commenter that it believes Marks “acted appropriately in line with our policy by refusing to do the piercing. Marks says that Claire’s also reached out to her personally, to assure her that corporate policy allows employees to refuse to pierce “distressed and resistant” children—and that it will revise the policy so it can’t be misconstrued. In a follow-up post, Marks noted the Claire’s employee hotline originally told her the opposite. She said that she’s not sure a policy revision will fully address the issue, but it’s a “great start.” Claire’s employees are under “tremendous pressure” to meet a daily goal of seven piercings a day, she added. “I do feel that the pressure to meet the on-paper goals has contributed to managers allowing for things to take place that really shouldn’t be taking place,” she said, noting that at one point, she was under so much pressure to make her quota, she got her own ear pierced. Claire’s, which consists of 2,000 stores and 6,600 concessions, emerged from Chapter 11 last year.